Q-How long is the journey from Edinburgh Airport to St Andrews or Dundee? A-It takes about 1hr 10mins, dependant on traffic and weather. Q-Do I cross the Forth Road Bridge? A-Yes, all regular/fixed priced journeys to Edinburgh airport or Edinburgh City are via the Forth Bridge only. Q-I haven't received my email confirmation? Q-Can I choose my preferred pick up time? Q-Is this a St Andrews shuttle service using buses? A-No, all transfers are in comfortable taxi cars. 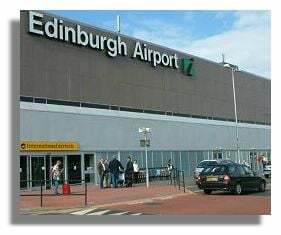 Q-How much is a taxi from St Andrews to Edinburgh Airport? Q-How much is a taxi from or to Dundee to Edinburgh Airport? Q-Where are the pickup points in St Andrews or Dundee? A-Pick up will be at your own stated collection address (Door to door service)..
Q-Where do I get the transfer back to St Andrews or Dundee once I've arrived at Edinburgh airport? A-Remain inside the terminal building at your Flight Arrivals area. Wait there and one of our driver's will meet & greet you, he will display your name on a 'Davidson Taxi Transfers" sign. Q-After being picked up from the airport, where will I be dropped off in St Andrews or Dundee? A-Drop off will be at the address on your request form. (Door to door service). Q- How do I pay? A-You can pay by telephone, online by Paypal/credit/debit card or we can email you a secure card payment link. If you cannot pay using any of these methods please contact us and we will make alternative arrangements for payment. Q-Why do you need my flight numbers and flight times? A-We ask for your flight number and time so you arrive at the airport in plenty of time and to monitor your arrival flight so we know when you have arrived at the airport. Q-What happens if my flight lands early? A-Remain inside the airport as instructed and wait for your driver. Q-Why do you need my mobile number? A-This is so we can contact you in relation to your travel arrangements and to allow your driver if required, to call you at the airport or your collection address. It will not be passed on to anyone else for any reason. Q-Can I have my driver's contact number? A-It is better to use our main number +44 (0)7837394760, feel free to add us to your contacts and pass it to others who could use Davidson Taxi Transfers. Q-What would happen if my flight is late and I/we might miss my taxi transfer? A-If your flight is late; if you have booked a private taxi transfer, your driver will wait for you (we do not charge extra for any stated flight delays on private transfers). Q-Why do you need to know what luggage I am bringing? A-We need to make sure we have enough space for ALL luggage. Q-What happens if I bring more luggage than I had advised at the time of booking? A-We will do out best to accommodate the extra luggage. However, if you have more luggage with you than we were expecting, we may charge £10 per extra item provided we can get this into the vehicle/luggage transporter. We reserve the right to refuse to take the extra luggage if we are unable to accommodate this in our vehicle/luggage transporter, this means you may be refused to travel with us and no refund will be given. (as per our Terms and Conditions). Q-Do i need travel insurance? A-All vehicles and drivers are individually fully insured and licensed by Fife Council, you are advised to have adequate personal insurance to cover all personal items. Davidson Taxi Transfers is not responsible for personal items at anytime (as per our Terms and Conditions).